I can't remember where I came across this particular photo, but I can't take my eyes off of it. The model on the right is none other than Wilhelmina Cooper, of Wilhelmina Modelling Agency fame. Girlfriend made herself some top coin as a model before going off to become an agent for models. Her agency is still considered one of the top ones. And so I came across this article about Willy. Added to my list of things that don't surprise me is the fact that she starved herself thin, and she smoked like a chimney -- both are habits that models have had since Jesus came. But I was shocked to read that Willy one was one of the heaviest models and.............wait for it...........SHE WORE A GIRDLE. Sounds like she thought of herself as one of the big girls. And that is something that I'd be happy to call myself if I could just look as cool as this. 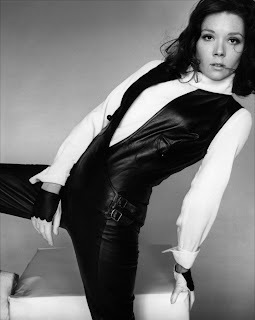 And by the way, today is Diana Rigg's birthday. She's another one who was annointed with the Essence of Cool. And honey, ScarJo as an Avenger ain't got nothin' on Miss Emma Peel. I love those black pants. I myself am going to start making my own vintage high waist pants from vintage men's patterns in the 70S. Butterrick really has some gems from then. I love the silhouettes. I really hope I can do my research and read upon pattern making and such before I just burst out and start sewing.